TV with Thinus: Netflix stuns as it passes HBO with the most Emmy nominations for the 70th Emmy Awards, although the winner remains M-Net. Netflix stuns as it passes HBO with the most Emmy nominations for the 70th Emmy Awards, although the winner remains M-Net. Netflix stunned when it passed HBO grabbing the most and more Emmy nominations on Thursday during the announcement out of North Hollywood of this year's nominees for the 70th Annual Primetime Emmy Awards, although M-Net remained the winner as the African broadcaster having the rights to the bulk of the nominated shows. Netflix snagged 112 nominations in total compared to HBO's 108. With the latest season of HBO's Game of Thrones seen on M-Net (DStv 101) back in contention, HBO did at least manage to get the most nominations for a single show (22) - as well as also for the second-most nominated show, Westworld (21), also shown on M-Net. It is the first time in 18 years that HBO hasn't received the most Emmy nominations - indicative of how Netflix is taking over in both volume and quality when it comes to creating and pushing TV content to viewers globally. Netflix is spending billions of dollars on locking up top producers and on commissioning an ever-growing array of original programming. The 70th Annual Primetime Emmys will be broadcast on Monday 17 September in the United States and will be shown on M-Net in South Africa and across the rest of Africa, from the Microsoft Theatre in Los Angeles with Saturday Night Live's Colin Jost and Michael Che as the hosts. "This year's nominations continue to represent increased diversity and inclusion in front of the camera. 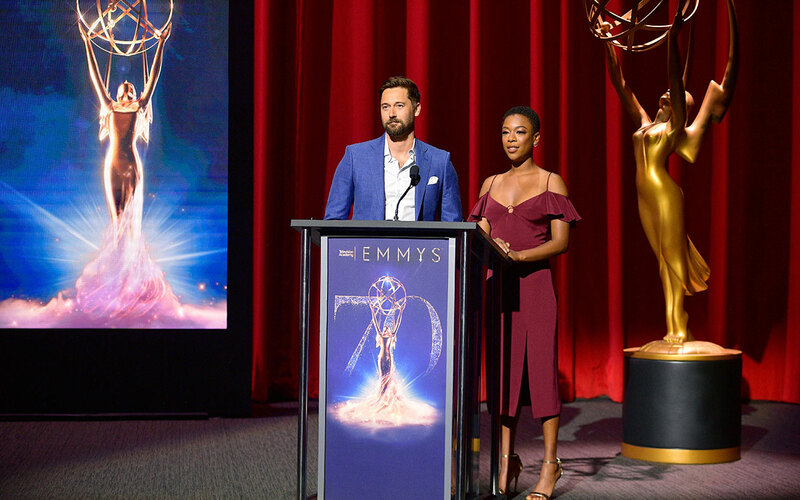 There is a wealth of new and returning programs that reflect so many of today's critical issues," said Hayma Washington, the Television Academy chairperson and CEO in a statement. As Netflix expanded its original content slate, it also dramatically started to up its number of Emmy nominees from 34 in 2015 to 54 in 2016 and 91 in 2017 when it came second to HBO. Now Netflix is in first place. "We congratulate our creative partners on their unprecedented success today, garnering Netflix a leading 112 nominations," said Ted Sarandos, Netflix chief content officer in a statement. "We are particularly enthused to see the breadth of our programming celebrated with nominations spread across 40 new and returning titles which showcase our varied and expansive slate – comedies, dramas, movies, limited series, documentary, variety, animation and reality." HBO in a statement said "HBO is very pleased with its 108 nominations, especially the wide range over so many categories. We're grateful to all our nominees for making this the eighth year we've had 100 nominations or more. We look forward to 17 September". Jennifer Salke, Amazon Studios boss in a statement said "We are extremely proud that the Television Academy honoured so many of our talented actors, creators and craftspeople across a number of Amazon series. This includes a record breaking number – 14 – for The Marvelous Mrs. Maisel making it the studio's most nominated series ever. It's truly a Marvelous day!" Counted by individual shows, in terms of South Africa and African viewers, M-Net still remains tops in first place, having the most nominated Emmy shows. M-Net, together with MultiChoice's satellite pay-TV platform DStv still manage to capture the bulk of the Emmy nominated content for DStv subscribers over its collection of other channels that scored Emmy nominations for shows. These include channels like The Sony Channel (The Amazing Race), BBC Earth (Planet Earth II), ITV Choice (The Tracey Ullman Show), National Geographic (Jane, Genius: Picasso), CNN International (Anthony Bourdain: Parts Unknown) and Comedy Central (Drunk History and The Daily Show) that have shows that got nominated. Put another way: While Netflix has the most single nominations, the combined nominations from shows on M-Net and across the rest of the channels carried on MultiChoice's DStv, are still - for now - more than Netflix. Also notable is that The Daily Show shown on Viacom International Media Networks Africa's Comedy Central channel in Africa scored its first Emmy nomination since South Africa's Trevor Noah took over, this time in the variety talk series category.